New from Microboards are the economical DVD copiers that burn DVDs at 18X speed and CDs at 48X Speed! The QD-DVD-1210 is a one-to-ten DVD/CD copier modeled after the popular QD-DVD-123. 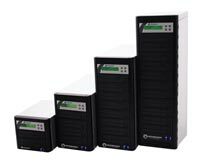 Microboards economical DVD copiers that burn DVDs at 18X speed and CDs at 48X Speed. With hard drive.